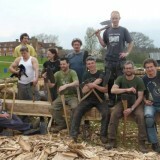 Students from the IBTC have arrived and project planning is underway. 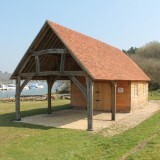 After months of hard work from skilled craftspeople the building is finally complete. 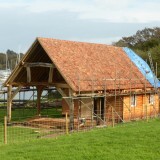 The tiling process is going well and the building is nearing completion. 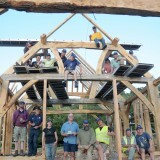 The team set to work to finish the frame. 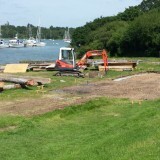 The long awaited day of the raising of the Shipwright Building arrives. 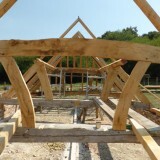 Progress is well underway and the timber frame is taking shape. 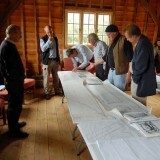 The first week-long July course has been a great success. 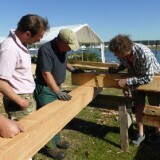 Timber framing courses started this week and the foundations are ready to go. 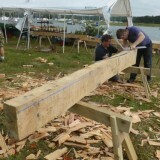 Henry Russell is now working with fellow professionals to finish off converting the timber for the Shipwright School frame.